In some ways online retailing is a godsend. It's quick. It's easy. And in many cases, it's actually cheaper. Factor in the added bonus of not having to contend with the crowds – an obstacle that's particularly obvious at this time of year as the January Sales rush kicks in. It's always the way: you see something you like on the shelf. But your goal is obstructed by at least two slowcoaches who have got there first. You go away for a nanosecond but when you've returned, your prize has gone, cruelly snatched from the shelf by those pesky slowcoaches. So hooray for internet shops. But in some cases, a visit to a shop is an experience not to be missed. And one of those is the bookshop. While ebooks are a great way for first-time writers to gain a foothold in an increasingly competitive market, there's still nothing like an actual printed and bound book. Entering a bookshop is like entering a whole other world. Rows and rows of books – whether old or new – are waiting to be discovered. Whatever your interest in reading – whether a simple story or a thirst for knowledge – a good bookshop can offer something for everyone. And of course, there's the smell. One thing that an ebook or online text can't offer is the unique smell of a bookshop. The freshly printed smell of new books or the accumulated years of second hand tomes both have their unique smell and that's just part of the appeal that bookshops have. 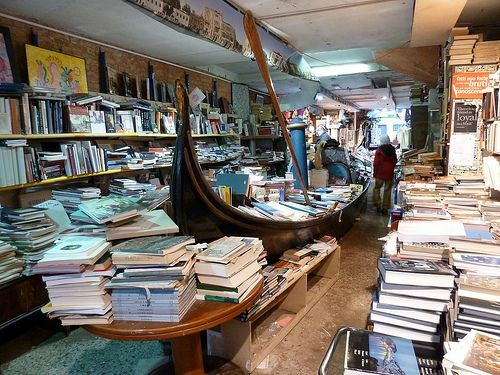 Italy has many great bookshops and libraries to visit, explore and browse through. There are plenty to choose from, whatever your book requirement. Research. Browsing. Or even enjoying a book with a warming cup of coffee. Here then are 10 great examples! Books. They can be read, analysed, studied... but in some cases they can literally become part of the furniture. That's the case with Venice's Libreria Acqua Alta. This unique destination not only proudly displays lots of excellent books – it also uses them as items of furniture. For example, some books have been made specially to become steps in a staircase. Or in Libreria Acqua Alta's courtyard, some of the tomes make up the wall panels. These little touches add up to a quirky and highly imaginative browsing experience. It's intriguing additions like this that make for an olde-worlde type atmosphere, belying the fact that Libreria Acqua Alta is only around 10 years old. A lot of thought and care has been put into the displays, with books peeking out of shelves, canoes and boats! The books themselves? A very good selection which cover all kinds of subjects including arts, food, the local area and also fiction best-sellers and comic books. 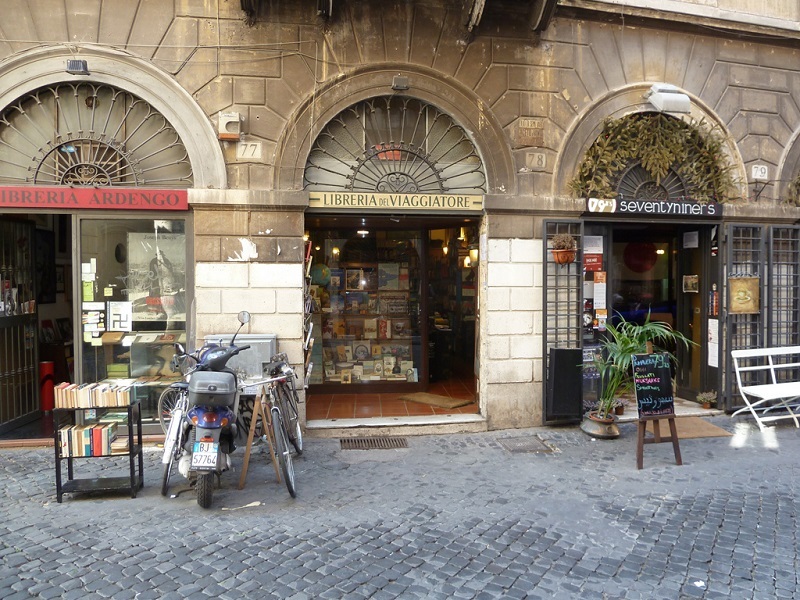 Only a stone's throw away from St Mark's Square, Libreria Acqua Alta is well worth a visit. Any good retail outlet knows how to adapt. The more that you make of your space, the greater the interest. Take Florence's Todo Modo, an independent book-store that plays host to more than 15,000 titles to choose from. All kinds of books can be found here from traditional used books to modern day ebooks. You don't have to drop in to Todo Modo – you can order a book through a number of ways: by phone, online or by other forms of app such as text, Facebook or WhatsApp. But a visit to Todo Modo is highly recommended. In addition to the fine selection of books, there are two other notable facilities. One is the bar in which you can enjoy food and drink in a comfortable, peaceful environment. You can, if you wish, pop in and enjoy a cup of coffee or a light lunch while enjoying one of the books or reading any of the newspapers or magazines on offer. Free Wi-Fi is also available. There is also a huge reading room that can also double up as the spot for hosting all kinds of events such as meetings, performances, special screenings, workshops and seminars. address: Via dei Fossi, 15 R, Florence. Once listed as one of the 20 most beautiful bookshops in the world by Flavorwire, Arion Esposizioni is part of the Palazzo delle Esposizioni museum. The museum's own bookshop boasts a massive selection of arts books, devoted to the realms of arts, architecture and design. In addition to the books, there are also DVDs, magazines, catalogues and CDs. And for the younger ones, there is also a healthy choice of books for children. 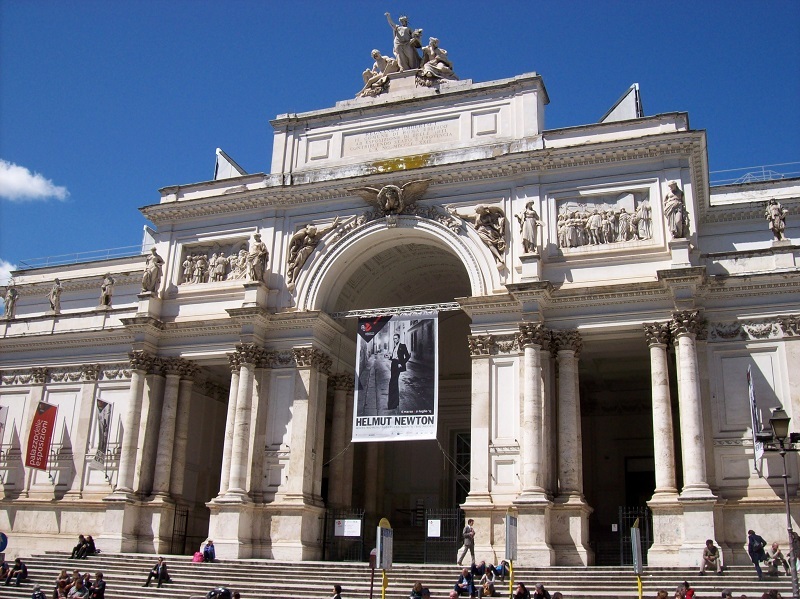 Offering a clean, modern and stylish environment, Arion Esposizioni is definitely worth dropping in to – especially for fans of arts and design. There is also a restaurant and café to visit if you've worked up an appetite looking through the books on display! address: via Milano 15/17, Rome. Looking for a rare book from the past? Well, you may well be in luck with Francesco and Claudia Massai's selection of antique books. The books are from the private collection of Francesco's and Claudia's family with volumes and manuscripts dating all the way back to the 16th century. Their website says that their uncle, Paul Gnerucci, was dedicated to collecting books and had assembled an impressive library. The books on offer are mainly aimed at the mail order and internet methods but it is possible to pop in and visit to discuss the intriguing and rare books available. At Libreria Bacbuc, there is a broad range available to all. It's a source of piquant books, rare and deleted volumes, manuscripts and bindings – all of immense historical and cultural value. Some of the works date back to the 16th century, making for a fascinating literary trip back through time. It's possible to order any of the books by phone or by email. The subjects on offer include archaeology, social sciences and economics. One of the big players in Italian bookshops is the family owned business, Librerie Feltrinelli. Originally, the first store opened in 1957, and by the end of 2012, there were 119 stores in operation. While it's a traditional book-store that offers a wide variety of books, over the years, the offerings have extended to DVDs, music, games, stationery and also ebooks. One of the latest innovations is called RED, which stands for Read Eat Dream. This initiative combines books, good food and drink, plus offline and online services, such as Wi-Fi and iPads. RED allows customers to browse the catalogue of books online or enjoy any of the books purchased with a great meal and a refreshing drink. Black Spring is based in Florence and is a relative newcomer to this book selling lark. Having opened in 2014, this independent bookshop has already put a Spring in the step with a warm, friendly atmosphere, plenty of books and also ample refreshments. The store is stylishly decorated with artistic photos, paintings and drawings, making for a modern, classy environment to explore. You can enjoy any of the books that you have bought with a good cup of coffee or tea. Open daily until 8pm, Black Spring is a worthy addition to the pantheon of Italian bookshops and definitely worth your while making a visit. They also host regular events, readings and more - keep in touch via their facebook page. address: Via di Camaldoli, 10. Libreria Del Viaggiatore originally started life in 1991. A 'traveller's library', it boasts all kinds of literary goodies connected with travel: atlases, travel guides and stories, and graphic books – new, rare and out of print travel treasures await. Sadly, one of the founders Bruno Boschin passed away in 2014 – but his legacy lives on in Libreria Del Viaggiatore. It has recently moved to new premises and while it retains its strong collection of new and rare books, it now offers a number of extras. It now also includes the Round Robin publisher with some special events proposed. There is also an area for presentations, space for exhibitions and displays, and training courses which will instruct visitors on how to write travel guides. address: Via del Pellegrino, 78. This is another great outlet that offers you the chance to source some rare, out of print books. Libreria Editrice Chiari is based in the heart of Florence, close to Piazza Santa Croce. It's open Monday to Saturday between 9.30am and 1pm and then 3.30pm to 7.30pm. It specialises in history, art, architecture, literature and philosophy, but also offers a good spread of books. Whatever your liking – biographies, sports, cookery, criminology or the local region – there will be something at Libreria Editrice Chiari to suit all literary tastes. address: Via Frà Bartolommeo, 35, Florence. This Sicilian treasure trove contains a wealth of books that offer information about the local area. There are books that deal with the traditions, folklore and mythology of Sicily as well as guides to the literature, archaeology and history of Sicily. Libreria Del Corso is also a good port of call for those who have a keen interest in the subject of art. There are many good books on the subject and will satisfy those who either have a passion for art or are studying the subject at college. Rare books, kids' books, great works of fiction... these are also comfortably at home in this fine bookshop which will please all literary aficionados. address: Corso Vittorio Emanuele, 332, Palermo. In addition, browse our online shop for Italy-themed books including guides, language help, poignant reads and beloved classics.